For us, one of the nice surprises this last Baselworld was definitely the stainless steel Rolex Yacht-Master II ref. 116680. A few years ago, Rolex introduced the Yacht-Master II. It wasn’t a successor to the Yacht-Master ref. 16622 but an addition to the collection. 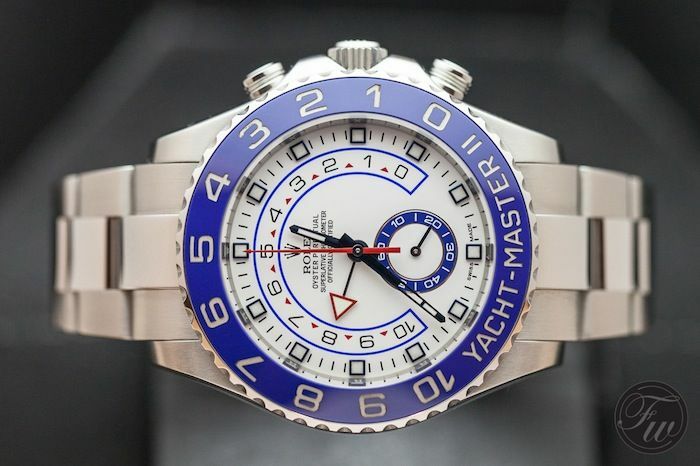 While the Yacht-Master was connected with yachting, there was no specific feature of the watch that would support the men on boats. Except for being water resistant. The Yacht-Master II is one of the few Rolex watches with a ‘real’ complication besides a date feature. The regatta (countdown) chronograph will help skippers in the yachting competition to have a perfect start. In this article, we will tell you how it works. When Rolex introduced the Yacht-Master in 1992, a full gold version in 40mm. It wasn’t until 1999 that Rolex came up with the Rolesium Yacht-Master (stainless steel and platinum), reference (1)16622. The Yacht-Master II was introduced in 2007 and until now only available in gold and bi-color versions. More history on the Yacht-Master can be found here. 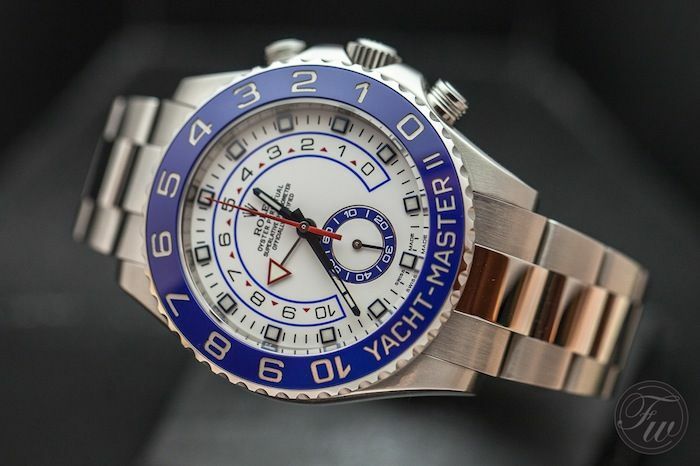 It seems that Rolex waits with introducing the stainless steel versions of the Yacht-Master a models a few years after the initial introductions. As written in the introduction, the Yacht-Master didn’t have any functionality for skippers. The functions were more or less the same as the Rolex Submariner and Sea-Dweller watches. A diving bezel (made out of platinum or gold though) and being water resistant. Even the movements are exactly the same. Now, as you know, Rolex isn’t the company that creates complications for their watches other than the extra hour hand in their GMT and Explorer II watches and a chronograph movement in their Daytona watches. The Day-Date and Sky-Dweller have a bit of an extra feature regarding a day indicator and in case of the Sky-Dweller, an annual calendar with a clever bezel mechanism. The Yacht-Master II is something different. Although it might appear as a normal chronograph at first, the inner scale with the 10 minute indicators and the bezel with large numerals counting down from 10 to 0 will reveal that something special is going on here. Although it looks kinda complicated in the specifications overview of the watch, it is a very easy to operate regatta timer actually. As you might know, in yacht racing you want to cross the line as soon as possible after the starting gun sounded. Before that, there will be an indication of X minutes before the start. 5 minutes is quite common but the countdown time can vary. Before 2000, it was 10 minutes. This is when you activate the chronograph on the Rolex Yacht-Master II ref. 116680. You will see that the inner scale will decrease per minute. Also, the countdown can be corrected on the fly so you can match it exactly to the official countdown timer. Before the race, you will need to set the watch to the proper countdown time. This can be done by moving the bezel into setting mode, unscrew the crown and use the crown in order to change the big red arrow hand to the correct countdown number on the inner scale. Rotate the bezel back to the original (operation) position and screw the crown back into the case. 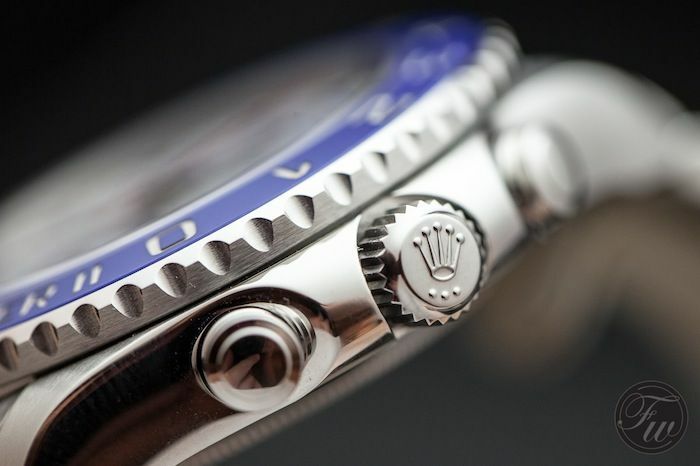 Rolex calls this functionality of the bezel “RING COMMAND”. Like other Rolex sports watches, the Geneva watch house used their famous 904L stainless steel for this Yacht-Master II. The watch has all features that the former introduced Yacht-Master II with precious metals have as well. The movement received some updates though, as it is caliber 4161 instead of 4160. Our guess is that they embedded some of their more recent innovations in there. We will get you the details as soon as we know them. The case is 44mm in size, which is exceptionally big for a Rolex watch. However, it certainly doesn’t wear too big nor is it an exceptional size in general. As you can see below on our wrist shot, the watch sits perfectly in place. Since skippers probably do not wear long sleeve shirts (like me on the picture), it is all fine. Since it is the perfect watch to wear on a yacht (or at least near the beach), Rolex told us it will become available this summer. 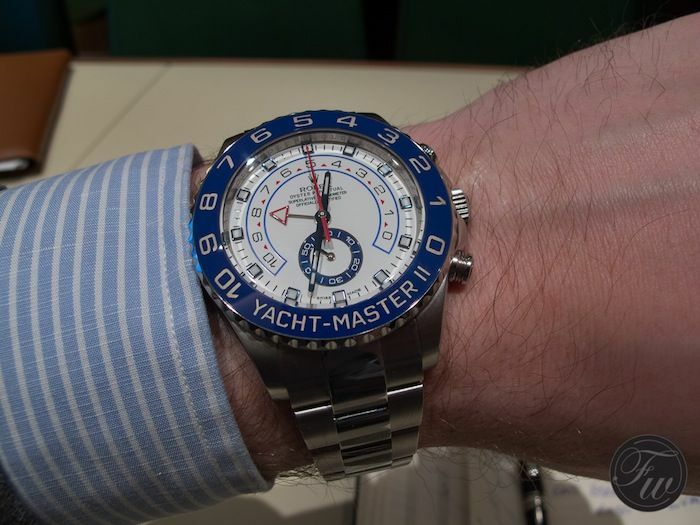 The price tag on this Yacht-Master II 116680 is 12.650 Euro (excluding VAT). A hefty price tag it may seem, but the regatta timer is a rather nifty complication. We can understand the price difference between the YMII and – let’s say – the normal Daytona chronograph timepiece.